Livestock producers across Ohio and the Midwest have been unable to apply manure this fall and early winter due to saturated field conditions. Most livestock farmers are really pressed for manure storage room. Waiting for frozen ground to apply manure is likely to be their only available option. Decisions about spreading manure on frozen and snow-covered ground are critical to minimize water quality impacts. Now is not the time to shirk on proper application methods. Constant changes in weather are typical of winters in Ohio which increases the potential for manure to move with surface run-off. Run-off can lead to polluting water resources including streams, waterways, and wells. Not only does this impact water quality but the nutrients are lost and not available for the next year’s crop. The USDA, Natural Resources Conservation Service (NRCS) Practice Standard 633, Waste Utilization outlines the Best Management Practice to reduce the potential of manure moving off-site. This Practice Standard will also help producers recycle nutrients more efficiently reducing the need for commercial fertilizer. Although Best Management Practices can help reduce the risk of pollution, one must keep in mind that the potential for manure run-off increases during winter application. This is why winter application of manure is not recommended and should only be done as a last resort. • Application rates are limited to 10 wet tons/acre for solid manure more than 50 percent moisture and 5 wet tons for manure less than 50 percent moisture. 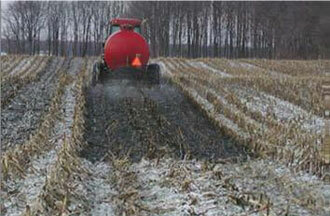 For liquid manure the application rate is limited to 5,000 gallons/acre. • Applications are to be made on land with at least 90 percent surface residue cover (e.g. good quality hay or pasture field, all corn grain residues remaining after harvest, all wheat residue cover remaining after harvest, well established cover crop). • Manure shall not be applied on more than 20 contiguous acres. Each 20-acre block should be separated by a break of at least 200 feet. • Utilize fields which are furthest from streams, ditches, waterways, surface inlets, etc. and are least likely to have manure move in a concentrated flow toward and into our water resources. • Increase the application setback distance to a minimum of 200 feet from environmentally sensitive areas and areas of concentrated flow such as grassed waterways, surfaced drainage ditches, streams, surface inlets, and water bodies. This distance may need to be greater when local conditions warrant (e.g. fields with more slope). • For Ohio Department of Agriculture permitted facilities and CLMs, setbacks should be 300 feet from wells and residences. • Manure applied on frozen or snow-covered ground should not exceed the nitrogen need of the next growing crop, or the crop removal rate for P2O5 for the next crop (not to exceed 250 lbs/ac), or the crop K2O needs (not to exceed 500 pounds/acre) or 10 wet tons < 50 percent moisture; 5 wet tons > 50 percent moisture; or 5,000 gallons of liquid manure per acre. Application rates are based upon the most limiting of these options. For fields with slopes greater than 6 percent, manure should be applied in alternating strips 60 to 200 feet wide generally on the contour, or in the case of contour strips, on alternating strips at rates identified above. Application rates, and cover and set-back requirements also apply. Winter application should not be part of a manure management plan and it should only be viewed as a last resort. Remember that if manure application during winter is necessary, preplanning to avoid fields where potential run-off could enter water passages will reduce pollution. Some states have prohibited manure application on frozen or snow-covered ground but it is still an option with very careful management in Ohio. More information on winter manure application can be located through your local SWCD, NRCS, or OSU Extension offices or the USDA-NRCS, Practice Standard 633. Visit http://oema.osu.edu for additional manure management information. To grow good crops only requires 50#/acre. Why would there be an index for P= 250#/acre? Who is monitoring soil sampling for N and P? Experiments performed at Wooster College by NRCS and Heidelberg University demonstrate that Std 633 is not viable and not backed up by science.. According to these tests manure application on frozen ground is never safe.